HI Los Angeles - Santa Monica v Los Angeles, USA: Zarezervujte nyní! If you're staying in Los Angeles, you want to be where the beautiful people are - and that's by the beach. 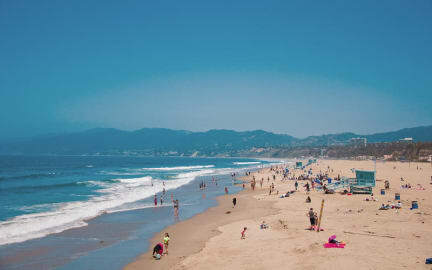 It's quick and easy to find from LAX airport and only a block from the golden Santa Monica sands, so you can start to sun yourself instantly amongst the impossibly perfect and tanned Californians. There are plenty of activities organised at the hostel itself, along with being close to the famed bar crawl routes. The hostel desk can also help you with tours of the Hollywood Walk of Fame and other attractions like Universal Studios. Just a block from the beach in amazing Santa Monica, HI Los Angeles Santa Monica is your laid-back base for experiencing the best of LA. This popular hostel is surrounded by cafes, restaurants, shopping, and bars, and is a short walk from the famous Santa Monica Pier. When you’re ready to explore the rest of LA, just jump on the nearby Expo Line light rail for easy access to Downtown Los Angeles, or book an LA sightseeing tour or trip to Disneyland right next door to the hostel. HI Los Angeles Santa Monica is fully equipped with everything you need to make the most of your travels, including tons of indoor and outdoor common areas where you can relax and meet other guests. Our awesome staff and volunteers lead daily free activities like comedy nights, pub crawls, Venice Beach and Downtown LA walking tours, Getty Museum visits, seasonal day trips to Malibu, and even hikes in Temescal Canyon, so you can check everything LA off your bucket list! I think that what Hostelworld guests like most about our property is our cool location, just a block from Santa Monica beach and pier and a block from shopping and great restaurants at the Third Street Promenade and Santa Monica Mall. The Getty Museum is just a bus ride away. Personally, I recommend that our guests visit Jinky's next door for an awesome breakfast. For fun we have a lot of activities going on, like BBQs, pasta nights, comedy, salsa, poker nights and more. I really think we have the best of both worlds here - if you want to socialise you can join our group activities, and if you want to chill out on your own you can relax in our casual, modern, warm common areas.